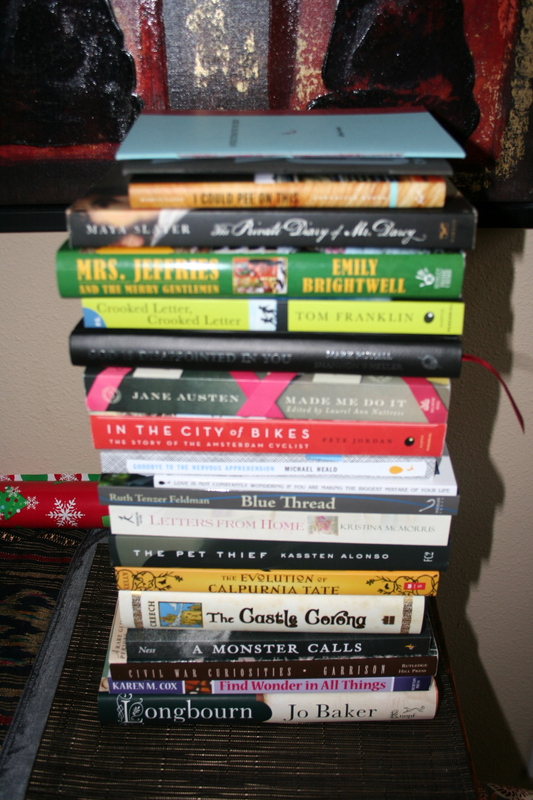 It’s been a book year in the Snoek-Brown household. I already posted about the book-shopping my wife and I did over the Thanksgiving weekend, but we’ve recently picked up several more books — some as gifts, some as door prizes, some as new purchases of our own — and yesterday, as I was straightening up the house, I stacked up all the books lying around the living room and realized we’d amassed 20 books in just the past couple of weeks! Which got me thinking how many books we’ve picked up over the past year in general, and gang, it’s a ton. Easily a few dozen, and that’s on top of the books stacked up in the living room. And while many of those books are older, things we’ve long wanted or have been missing from our collection, a whole bunch of those books are brand new, just published this year by friends of mine. Consider this your shopping list. Pick as many as you want or can afford; give liberally as gifts to friends and family. I haven’t got round to all of these — some I haven’t bought yet myself, and some I’ve bought but haven’t got around to reading yet — but many of these I can personally recommend. And, actually, I could recommend all of them, because I know some great writers, folks, and I trust that these books are all great even if I haven’t read them yet. Below is a list of the books, by sort-of-genre, but it’s just a list. My librarian wife likes to say that we all judge books by their covers, regardless the usual admonition against it, and she’s right — sometimes we grab books on instinct, based partly on what they look like — so below the list, I’ve made a gallery of all the books I can find covers for. You can also find most of these on a special bookshelf I’ve created in Goodreads. What a great, resounding cheer of literary joy this list is, Samuel. I have a few of these on my bedside reading stand, a few on my to-buy list, a few on my gift list, multiple copies of one of these in boxes in my house (being a publisher), and I will have to look into the others. Thanks for sharing. You published Stevan Allred’s A Simplified Map of the Real World, yes? I’m kicking myself that we ran out of funds before I could grab that at the Oregon authors event at the Historical Society after Thanksgiving! I’ve been hearing good buzz, and I love story cycles (I’m teaching a class on them now). That book is WAY up my to-buy list (I might try to wrangle a copy of Christmas), and I’m looking forward to reading it. Thanks for publishing it!